https://civicrm.stackexchange.com/ is launched in beta and thriving as a place to ask and answer questions about CiviCRM. The benefit of the Q&A format is that good questions and good answers can get voted up, and better serve as an expert repository of our community's experience. Search rankings will soon be able to find good relevant answers to everyone's beginner and expert support and development questions. Already we're averaging 10.9 questions per day, which is more than the 9.9 new topics started per day in http://forum.civicrm.org during the first quarter of 2015. 267 people have asked questions with a score of 1 or more, and 123 people have posted an answer that earned a +1 score or above. More than 90 percent of questions are answered, which is a healthy beta. There are over 550 users after two months, and 40 have asked or answered enough questions to get 200+ reputations. We're doing okay with 1.8 answers per question, though 2.5 or more would be ideal. It turns out there is an automatically generated newsletter for our community. I recently subscribed to it and found it was great. Things I'd always wondered about were being answered, and I saw a place or two where I could leave a pointer or two. 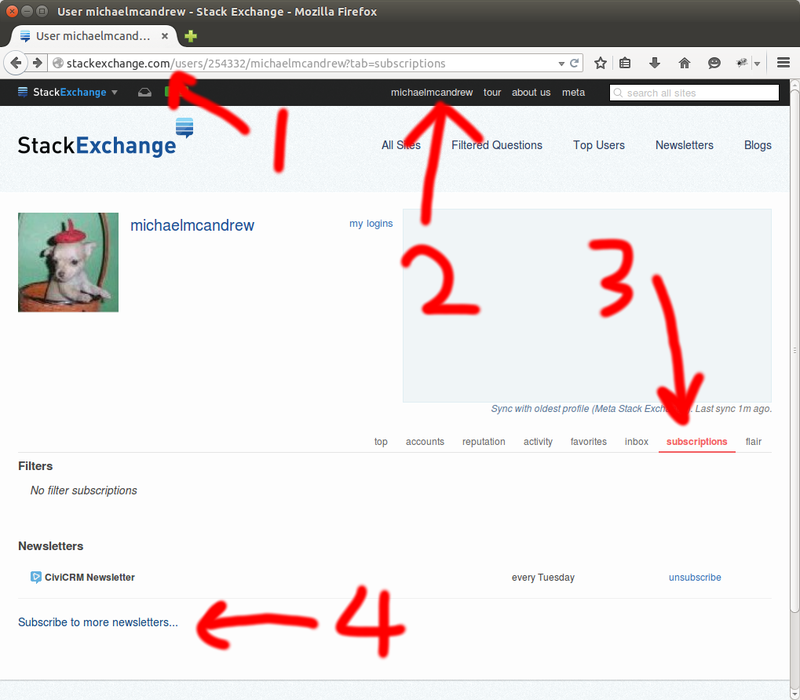 Go to http://stackexchange.com and login. NB: Don't go to http://civicrm.stackexchange.com for reasons outlined in comment. Click on your name to get to your profile. Half-way down the page, click on the subcriptions link. Click on Subscribe to (more) newsletters and click on 'subscribe' link beside CiviCRM (or other communities'). Thanks to everyone for making the new CiviCRM StackExchange space such a pleasure visit and a great shared resource. Subscribe to the Newsletter, and click in to interesting questions! This did not work for me... then I figured out why. I was logged into civicrm.stackexchange.com, which is not the same as being logged into plain old stackexchange.com. Clicking on my username gave me a different screen... similar, but lacking the subscriptions tab. I was able to click on "Edit Profile & Settings" on the site-user-profile screen, navigate to "Preferences", and click a checkbox to subscribe to the newsletter. I found that clicking on my username as you instruct has different results whether I am viewing the meta stackexchange site, the meta-civicrm site, or the civicrm beta site. I also ran into a problem where on my profile preferences form, I clicked "Manage newsletter subscriptions" instead of just clicking the checkbox. This took me to the meta stackexchange where it no longer recognized me as logged in. Strangely, once I typed in the url in my address bar, instead of using their links to navigate to the meta stackexchange, it automatically recognized my logged in state and I was finally able to see the screen that you took a screenshot of. Thanks, Michael. I've updated the directions to make this more explicit.